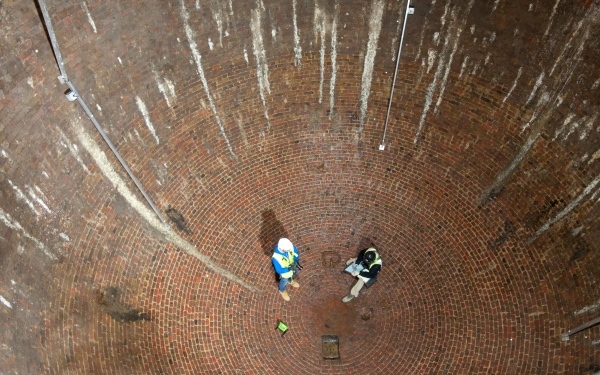 An 18th century ice house has been (re)discovered beneath the streets of Marylebone during a residential development project known as Regent’s Crescent. The subterranean red brick ice house – which measures 7.5 metres wide and 9.5 metres deep and was built in the 1780s – was used by pioneering ice-merchant William Leftwich during the 1820s to bring high quality ice to wealthy households and service the trend to serve frozen treats to guests as well as supply increasing demand from food retailers and medical institutions. Leftwich, seeing a niche for clean, quality ice (ice sourced from local canals and lakes during winter was often dirty), shipped ice collected in Norway’s frozen lakes and then transported it into London via Regent’s Canal. 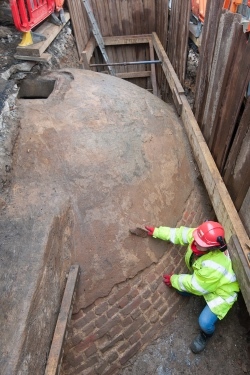 Now listed as a scheduled monument by Historic England, the egg-shaped ice house was rediscovered by MOLA archaeologists who were working on the site on behalf of property developer Great Marlborough Estates. It will now be incorporated into the gardens of Regent’s Crescent which have been newly designed by Kim Wilkie as part of the £500 million development project. The Grade I-listed crescent was originally designed by John Nash (of Buckingham Palace and Brighton Pavilion fame) and built in 1819. The houses were destroyed during the Blitz and replica properties were built in the 1960s. But the ice house, an entrance tunnel and ante-chamber all survived the bombing and remain in what MOLA has called “excellent condition”. It is anticipated that the ice house chamber will be open to public viewing via a special corridor during archaeological and architectural festivals. PICTURES: Top – Buildings archaeologists from MOLA record the interior of the ice house/A MOLA archaeologist brushes the near perfect exterior of the ice house exposed during excavation in 2015 (Images© MOLA).